25 Facts about Tim Burton and Some of His Movies! Here are 25 facts about Tim Burton and some of his movies. Enjoy! 1. Tim Burton was born on August 25, the same day as Gene Simmons from the band KISS. 2. He was an animator, story-board artist, and concept artist for Disney during the making of The Fox and the Hound. He also ended up doing some work on The Black Cauldron before he was booted out for being to creepy. 3. He has stated that Jack Skellington, from The Nightmare before Christmas, is his favorite character. He makes cameos in some of his movies including, James in the Giant Peach, Coraline, Alice in Wonderland, The Princess and the Frog, Sleepy Hollow, and Beetlejuice! 4. He wears Pinstripe socks to all of his movie premieres and special occasions for good luck! 5. He designed a balloon for the Macy's Thanksgiving Day Parade, called B. Boy. He even went so far as to make a back story for it. B. Boy was made up of used balloons from a children's hospital in London and he was kept in the basement. Obsessing over the story "6," and dreaming of flying. 6. Burton was such a huge fan of the musical Sweeny Todd: The Demon Barber of Fleet Street that he saw it 3 times on Broadway. 7. He said that working on the Batman Returns set was difficult, because the live penguins were huge divas! 8. He directed the "Bones" music video for The Killers. 9. He likes to film a dinner scene in his movies. Keep an eye out for one the next time you watch one of his movies! 10. When Norther Winslow shows his unfinished poem to Edward in Big Fish, the handwriting is actually Tim's. 11. The factory Charlie's dad works at in Charlie And the Chocolate Factory makes Smilex toothpaste. This is the same toothpaste the Joker was selling in Batman. Are all of his movies somehow connected? 12. In Batman Returns, Michelle Pfieffer had to be vacuum sealed into her Catwoman costume. Talk about a tight squeeze! 13. He says that he's sad because the media portrays him as a weirdo, but in real life he's just a normal guy. He said, "You know, I could put on a clown costume and laugh with the happy people, but they'd still think that I'm a dark personality." 14. He helped Obama throw a Halloween party at the White House in 2009. He made the room look like the Tea party scene from Alice in Wonderland. He even went as far as to convince Johnny Depp and Mia Wasikowska to dress up and show up in character as the Mad Hatter and Alice! 15. Before Miley Cyrus was famous, he cast her in her first film role as Ruthie when she was 8-years-old in Big Fish. 16. Instead of using computer animated graphics, he had 40 squirrels trained to crack nuts in the scene where Veruca Salt goes down the garbage shoot in Charlie and the Chocolate Factory. 17. Burton wanted Lydia's dress to be in red in the wedding scene in Beetlejuice, because of the old rhyme that says, "Married in red, better off dead." 19. 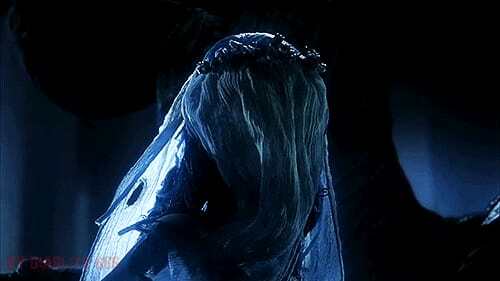 He created Corpse Bride for his wife, Helena Bonham-Carter. 20. He and Helena Bonham-Carter have 2 kids together, and Johnny Depp is the godfather to both of them. Tim Burton says that he admires their friendship so much, and in an interview he said, "What more can I say about him? He is a brother, a friend, my son's godfather. He is a unique and brave soul, someone that I would go to the end's of the Earth for and I know, full and well, he would do the same for me." 21. He has made cameos in Cameron Crowes' singles, "Hoffa and Men in Black 3." 22. Burton's favorite movies are Dracula A.D. 1972, The Wicker Man, The Golden Voyage of Sinbad, The War of the Gargantuas, and The Omega Man. 23. Despite being the main character in Beetlejuice, Michael Keaton only has 17 and a half minutes of screen time. 24. Tim Burton wrote the gas mask note in Batman, when Vicki Vale is given a note with her gas mask at the museum. 25. Burton says that he grew up on horror movies and that he was never really scared of them, only fascinated. Thanks for reading and go check out my other stories! Reading Memorial High School Drama Club's 'Mamma Mia' Was Fantastic!